I'm Matt from Volumes of Fun, a hobbyist software studio based in Europe. We're probably best known for the open-source C++ voxel management library, PolyVox which is available for commercial use by all for free. On top of PolyVox, we also develop and sell Cubiquity, a 3D engine integration layer. 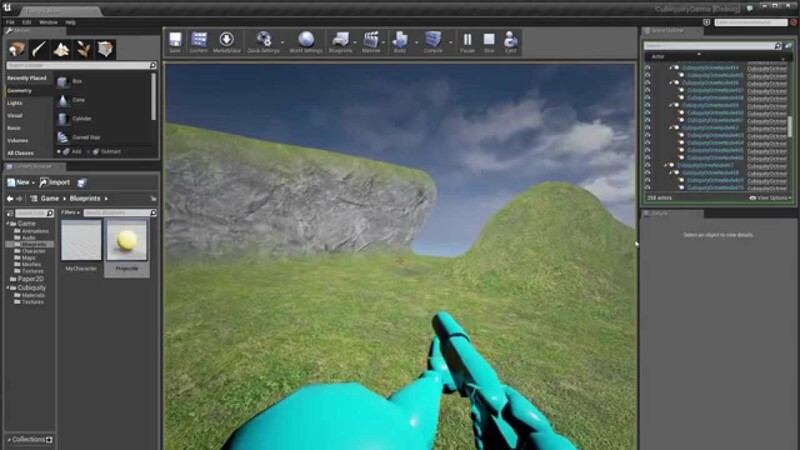 So far, most of our work has been focused on Cubiquity for Unity 3D but we've been fans of Unreal Engine for a long time (since the first game) and so we are now actively working towards getting Cubiquity for UE4 off the ground. For the Unity3D version we provide a completely free version for non-commercial use and a $200 license for use in commercial products. I imagine we will have similar terms for the UE4 version but this is not set in stone yet. Next, I'm planning on getting live editing of the terrain working (both in edit mode and play mode) which will all be exposed through blueprints. Support for both smooth terrain and colored cubes type environments (video examples from Unity3D). Support for multiple volumes which can exist in transform hierarchies. Unique material blending algorithm on smooth terrain. 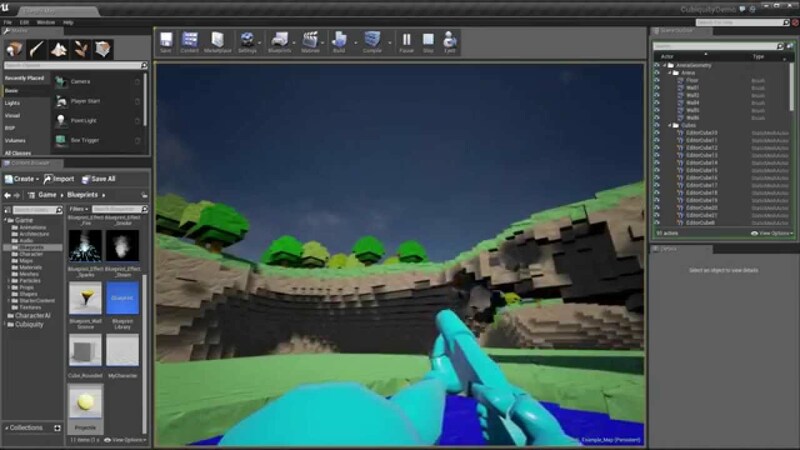 Direct voxel access for implementing procedural generation. First demonstration of large coloured cubes data being loaded into Cubiquity. Voxel data from Ki11aWi11. A view showing a chunk of the map from the top of one of the buildings. Raining down destruction on the ground below. Everything in the map can be destroyed and interacts properly with the physics engine. If anyone has any questions, I'd be happy to answer them. Last edited by milliams; 02-23-2015, 09:11 AM. Looks awesome. I've been a big fan of voxel terrain since about 2003, and although you can achieve somewhat similar effects using static meshes these days, you can't beat how intuitive voxel editing can be. Would be interesting to see that example with texture blending (based on an alpha) and tesselation - I think that could avoid the typical problem of 'smoothness'. Does the plugin import a completed mesh ingame, or does it have dynamic LOD? Yeah, we've been working with voxels for a long time. The earliest parts of PolyVox date back to around 2006. I agree that editing voxel terrain can be nicely intuitive as I think we show in this video. We've got some interesting plans for the future for using Dual Contouring with some custom tweaks to get the best compromise between smooth and sharp features. The plugin breaks the volume down into chunks in an octree and creates a mesh for each chunk. Cubiquity includes the ability to load dynamic LOD versions of octree nodes as shown in this video using Gameplay3D. LOD isn't working yet in UE4 but it's on the list. So got a few questions about Cubiquity as well as a few suggestions. 1. Does Cubiquity allow for infinite terrain? 2. What are the file size of individual .VDB files? 3. What platforms are supported with this plugin so far? 4. Is Cubiquity network ready? 5. Are the block and smooth terrain going to be toggle able via a bool or will it be a shader option? 1. Can we import real world terrain data (Heightmap) into Cubiquity for making real life game worlds? If not would this be possible? 2. Would it be possible to hook this up to the World Browser Tools? This would allow us to arrange out voxel terrain to fit our worlds needs as well as layout. 3. Support Biome Generation at runtime both via blueprint and C++. 4. Support AI navigation with cubiquity. 5. Support network replication via blueprint and C++. 6. Support for Optional Destruction of terrain at runtime. Last edited by HeadClot; 08-16-2014, 04:16 PM. Please let us know when you need testers. You are one of only 3 people I follow on twitter. And Cubiquity in UE4 was exactly what I was hoping for. At present, no. There's support in PolyVox for infinite terrain but it is not yet exposed to Cubiquity. This is because different engines support this sort of thing in different ways. This is something we may look into in the future but I'd have to defer to David for any more idea about priority. The VDB for the volume shown in the screenshots above is ~300kb. The VDB file is essentially a SQLite database containing the information so there is some generic compression going on there as well. The VDB for an equal-sized cubic terrain volume is about 10% of that size. At present Cubiquity for UE4 is only being tested on Windows since the UE4 Linux support is only basic at present. Cubiquity itself works on Windows, OS X and Linux and the UE4 plugin will follow this once it starts to get stable. Cubiquity itself has no built-in network support. However, within UE4, it should be simple enough to integrate it with the standard network replication to work as expected for a multiplayer-type game. The blocky and smooth terrain meshes are created by different function calls and the geometry is distinct. We have some interesting long-term plans for combining the two modes using a Dual Contouring variant which would allow per voxel sharpness to be set to have the two styles in one volumes. Absolutely. This is relatively trivial to support. There's no in-editor tooling for this yet in UE4 though. The only slight complication would be texturing; usually with heightmaps you have a set of texture masks for the surface material but with voxel terrain you need to set the material in the bulk if you want any destructibility. I haven't really looked into WorldBrowser much yet but I think it would definitely be in our plans. It's exactly this sort of engine integration which we're aiming for with Cubiquity. We want to make sure people's workflows with traditional terrain can carry across to Cubiquity. This is a layer above what we're currently planning with Cubiquity. For the first release at least we will be providing only simple authoring/importing tools. However, since users will have full access to the underlying volume data, anyone could write their own in the meantime. In PolyVox we have an implementation of A* through a volume with customisable logic. It's not exposed in Cubiquity yet though. Once it is, we would want to make sure it's integrated well with the expected UE4 tools. Otherwise, since Cubiquity creates standard Unreal meshes, and 'magic' path-finding tools which automatically locate flat surfaces would work anyway. In the medium term we would recommend using an existing solution for this. Certainly planning on this. It will be waiting until we have feature parity with the Unity3D version though. This is going to be one of the next things I get working. PolyVox and Cubiquity have excellent support for this as shown in this video. Will do. As son as I've got the base functionality working and have packaged it up as a proper plugin, I'll advertise on this thread for some initial testing. Are there plans for in-editor creation/sculpting? Or will it be a separated voxel editor from which you can only import your finished meshes? We have plans to have full sculpting + texturing support inside the editor. You can see what we have in Unity3D in this video. Alongside this we have support for importing volumes from external editing tools (such as MagicaVoxel as seen in the docs) and it's very simple to extend this to cover new tools too. One thing that would be really awesome is if you could take the mesh extracted from the voxel data and bake it into a static mesh along with UVs. That would allow you to use it as a level design tool ala BSP, but with the awesome quality and organic shapes that the smooth voxels give you. Last edited by KRushin; 08-23-2014, 01:14 PM. You could even use it as a perfect sketching tool then. Build the voxel thingie you need in that exact position. Bake it into a mesh and export it. Use your favourite 3D app to add details and custom textures. Import the new mesh fitting perfectly. Hell yeah. That would be fantastic. This would be technically possible and could make sense for very static terrains. The problem with UVs is that voxel terrains are difficult to unwrap to a 2-dimensional map. Instead of this, Cubiquity uses tri-planar texturing which is much more robust for our needs. Of course, you could still do the texturing yourself using the Cubiquity example. Since implementing this feature would take time away from getting the primary features working, it would have to be something we defer until the future but do remind us of it and if there's enough demand, things might be moved around in priority. It's very difficult to say. I would estimate, based on the timings for the Unity3D version, that it will be several months until I have a testable beta version working and perhaps 6-9 months after that until a first release. Of course, it could easily end up being longer than that as all the development work is done in our spare time. I will be making updates here though so it should all become clearer as we get closer to the time.